Dave Manning heads to deepest Staffordshire to find a collection of vintage machinery that is begging to be ridden. While the very fact that you’re reading Old Bike Mart shows that you probably have an interest in motorcycles of a certain age, it doesn’t necessarily follow that each and every reader owns a large and varied collection of old (and very old) two-wheeled machinery. And, for most of us, while we may get the chance to ride friends’ bikes if we’re lucky enough for them to trust us, the chances are that we’ll not be fortunate enough to ride some really old machinery unless we stump up the wherewithal to actually buy such a machine. And what person would want to lay out a significant amount of folding without ever having tried a similar machine to see if they like it? Two-stroke haze and the smell of castor-based oil make for a perfect day in the country. The venue is Curborough sprint course near Lichfield, a popular venue with local motor racing clubs that hold regular twisty sprint-type events and, for this day, was split into two areas – a short, narrow and twistier section for the slower, lower-powered machinery, and a more open, faster circuit for the quicker machinery. 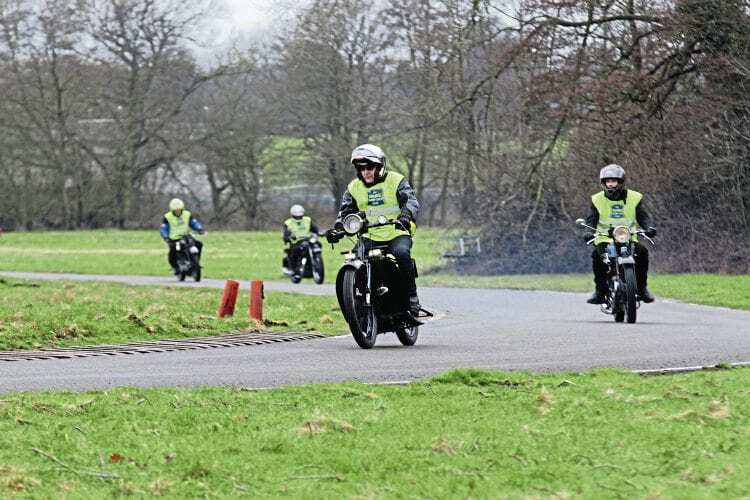 The bikes in question tend to vary for each training day, depending on what is available (most bikes are privately owned, although some are actually club bikes, owned by the VMCC) and what other events are taking part around the time in question. So, with about 20 of us kitted out in our VMCC fluorescent tabards, we split into two groups, one heading for the ‘fast’ part of the track and the larger machinery, the other to hit the twisty lower section aboard some less feisty machinery.